When it comes to national costume, we don't think there's anything that can match Scottish kilts! They're colorful, exotic, stylish... and just plain cool! Although it's not only we Scots who can lay claim to the kilt as a form of national dress, traditional kilts are recognized around the world as a symbol of Scotland. In it's most original form, the kilt was a piece of clothing uniquely suited to the practical needs of Highlanders, and may have it's roots in the type of clothing worn by the numerous invaders who landed on Scottish soil so long ago. It has changed a LOT since, is now most often seen at ceremonies and official occasions ranging from weddings to military processions. The kilt that you're seeing in your mind's eye is very different from the original garments worn by Scots all those centuries ago. Although associated with Celtic culture now, originally the word 'kilt' may have come from the Nordic word 'kjalta', first recorded back in the 9th century. Early in it's history, Scotland was invaded by several countries (including Romans, Vikings and Scandinavians). 'Old Norse' was the original language of the Scandinavians. These invaders all dressed differently, in a variety of tunics, robes, shirts and cloaks. It's not clear exactly how the kilt evolved but it's believed that it's a combination of all of these, adjusted to suit the climate and lifestyle of the hardy, warlike inhabitants of the Scottish Highlands. During the 16th century, the first Scottish Kilts known as 'Feileadh Mhor' (meaning 'Great Kilt' and pronounced 'feela mor') appeared, and are also referred to now as the 'belted plaid'. 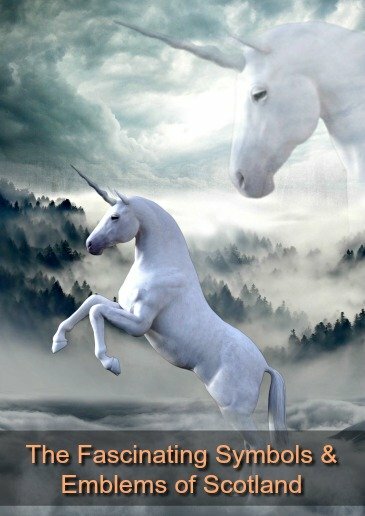 * Spoiler Alert * Although Mel Gibson wears a Great Kilt in the movie Braveheart, in reality these didn't exist during the 13th century (which is the timeframe the movie represents). Here we'll start with the Great Kilt (or Belted Plaid). Traditionally the Feileadh Mhor was made from one length of a thick, wool cloth known as 'breacan' (a Gaelic word meaning speckled or partly colored). This cloth was usually about 5ft wide and could be up to 21ft long. Several feet of the fabric was folded into loose pleats and wrapped around the wearers' waist, then fastened in place with a thick, leather belt. The rest of the cloth was thrown over the shoulder, and tucked into the belt at the back. This spare material could also be pulled up over the head and shoulders to protect whoever was wearing it from cold winds, and heavy rain or snow. The whole thing was worn over a long sleeved tunic, which reached the knees. Over a hundred years later, around the middle of the 17th Century this early, heavy and rather awkward, version of the kilt began to be replaced by the 'Feileadh Beag' (also known as the 'Philabeg' and pronounced 'feela beg'). This was basically the lower half of the Feileigh Mor and consisted of a single (shorter) length of breacan, loosely folded, wrapped around the waist and again secured by a thick belt. There was no 'extra' cloth to throw over the shoulder or use as a cloak, and this variation was also known as the 'Walking Kilt'. In the 18th Century, the loose folds were widely being replaced by pleats that were sewn into the fabric, making the whole outfit much easier to wear. For a while both styles were worn by Highlanders, but over time the older Great Kilt disappeared from everyday wear as the more comfortable Walking Kilt took it's place . By this point in history it was much more recognizable as the ancestor of today's kilt. 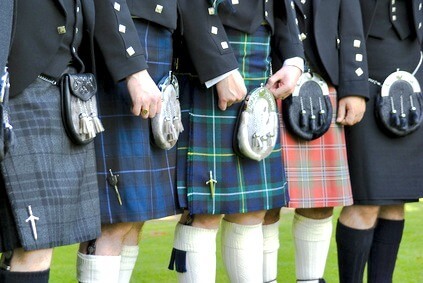 The Scottish Kilt Is More Than Just An Outfit! Scottish Highlanders were strong, proud and extremely patriotic and historically the kilt was much more than a versatile piece of clothing, it was a symbol of their heritage. For centuries the English had been trying, mostly unsuccessfully, to subdue the unruly inhabitants of this wild land, and the humble kilt became a casualty of this conflict. Needless to say, some Scots chose to simply ignore the ban and continued to wear the kilt in protest. Human nature being what it is, this attempt to stamp out kilt-wearing actually backfired and only served to make it more important to the patriotic Scots. It's position as a symbol of Scottish culture and national pride, rather than just the traditional Scottish clothing worn by Highland clans, was cemented and continued to grow. Between 1746 and 1782, although it was against the law for your average person to wear a kilt, armored regiments in the military were actually encouraged to do so. 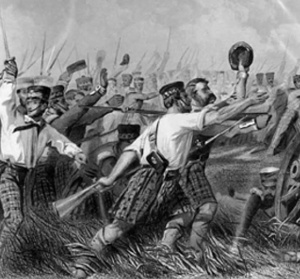 This was more maneuvering by the English, this time the exemption from the rules of the Dress Act was used by the British Government as an incentive to get the fearless and war-like Highlanders to join the Kings' armies. These 'Highland Regiments' were then sent overseas to fight in places as far away as India and North America. The theory behind this plan was that many Highlanders would be 'taken out of the equation'. Hopefully making Scotland (and the Scottish people) easier to control. Almost 40 years later, in 1782 King George IV gave the Scottish kilt a new lease of life, and a respectability and acceptance that it hadn't yet seen. During a visit to Scotland the King was surrounded by kilt-wearing Scots and even wore a beautiful one himself. More Royal approval followed because his successor, Queen Victoria, loved Scotland in general, and the Highlands in particular. So, after trying to stamp it out, the English eventually did an about-face! Although todays' kilts are always made from tartan fabric, and each tartan is closely identified with a particular Scottish Clan, this wasn't the case until well into the 18th Century. Again, it was the English that began the trend towards giving different tartans specific identities and names, beginning within the army where each Highland Regiment was allocated a different tartan. So, exactly what is a Scottish Tartan, or Scottish Plaid? It's a woollen fabric that evolved from the original 'breacan', and is made up of an orderly checkered pattern, usually involving several different colors. The checkered pattern consists of colored vertical and horizontal lines, woven into the fabric to form a very distinctive pattern of lines and squares - this is known as the 'sett'. Historically, any relationship between a particular color or pattern was generally a connection to a particular geographical area or district, rather than to an individual family or Clan. In the 18th Century this began to change and certain guidelines and policies were set up which meant that a Clan could take 'ownership' of a specific tartan pattern/sett. 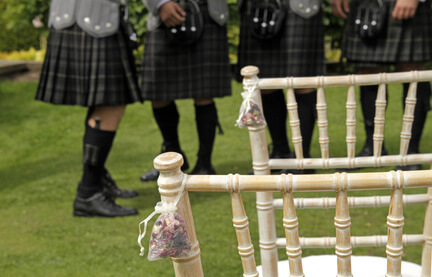 In the early 19th Century, Clan Urquhart tartan was the first to be formally registered. Although most tartans are owned by a particular Clan, there aren't really any laws or rules about who can (or can't) wear a tartan kilt. Those of us with Scottish ancestors, or family, may have more than one Clan tartan to choose from, as it's perfectly okay to wear your fathers', mothers' or even another family members' . If you don't have Scottish roots, or they're too convoluted for you to follow, there are plenty of more 'generic' patterns you can wear.... or you can choose absolutely any one that you want. You don't have to be a legally recognized 'Campbell' to wear a Campbell tartan for example. But of course wearing the right kilt doesn't make you a clan member either! Although the kilt is 'the national costume' of Scotland, you won't see it being worn on a daily basis at the office, or in the supermarket! It's most often worn on 'high days and holidays', so basically for ceremonies and special occasions. These can including weddings, funerals, family parties, festivals and more. 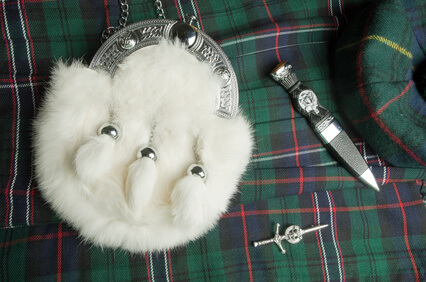 It's also worn by Highland Bands, Highland Dancers, and participants in the traditional Scottish Highland Games. Some Army regiments (and not just the British Army) also have the kilt as part of their 'dress uniform'. The last time that kilts were worn in active combat was in 1940 (early in World War II), when the Royal Highland Regiment fought against the German army. A real Scottish kilt should be tailor made to fit YOU, not bought 'off the rack'. Because of the way they fasten and fit, a kilt that isn't exactly the right size won't hang correctly - spoiling the 'look'. Shoes - Known as Ghillie Brogues. Sturdy leather shoes with laces (shoe-strings), traditionally designed without a tongue. They probably evolved from the early Highlanders' footwear which consisted of leather or hide wrapped around their feet, and secured with leather thongs. The age-old (and seemingly endlessly fascinating) question of what is worn under a Scotsmans' kilt is actually fairly simple.... usually nothing! 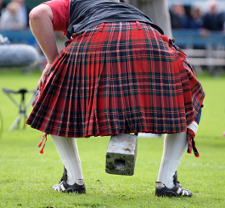 Historically Scottish Highlanders wore a tunic (liene) under their kilts, and nothing else. Boxers, boxer-briefs or any other kind of underwear wasn't part of their attire. Given the rugged nature of their existence it's not really surprising that wearing underwear (or rather NOT wearing underwear) wasn't high on their list of priorities. 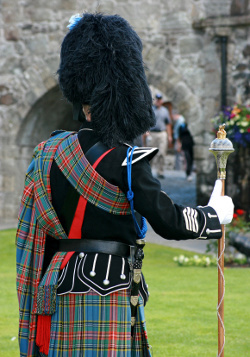 Even the Scottish regiments traditionally went without under-garments when wearing their Scottish kilts. This is likely origin of the phrase 'going commando'! Outside of the military, it's entirely a matter or personal choice whether or not a Scotsman wears anything under his kilt, but it seems that most choose to follow the traditional route. The only real exceptions to this rule are Scottish Dancers and anyone who is taking part in Highland Games. In those situations most choose to wear shorts, or other underwear (thank goodness! ), rather than shock or offend their audience.